To Cite: Armin S, Fallah F, Navidinia M, Vosoghian S. Prevalence of blaOXA-1 and blaDHA-1 AmpC β-Lactamase-Producing and Methicillin-Resistant Staphylococcus aureus in Iran, Arch Pediatr Infect Dis. 2017 ; 5(4):e36778. doi: 10.5812/pedinfect.36778. Background: Methicillin-resistant Staphylococcus aureus (MRSA) is resistant to most antibiotics and can transfer resistance to other bacteria, which is a significant problems among hospitalized children with MRSA infections. Objectives: The aim of this study was to detect blaOXA-1 and blaDHA-1 AmpC β-lactamase-producing MRSA in hospitals. Materials and Methods: In this descriptive study, 21 MRSA samples isolated from healthcare providers’ nostrils and 35 samples isolated from clinical cases, obtained between August 2012 and July 2013, were examined. Antimicrobial susceptibility testing was performed using agar disc diffusion (i.e., the Kirby-Bauer method). Polymerase chain reaction (PCR) approaches were used to examine MRSA molecularly for blaOXA-1 and blaDHA-1 AmpC β-lactamase genes. Conclusions: Improper consumption of antibiotics and environmental factors play important roles in the emergence and spread of antibiotic-resistant MRSA. Thus, the significance of the isolates from this study was that they were assayed for the presence of resistant genes, such as blaOXA-1 and blaDHA-1 AmpC β-lactamase, in healthcare worker and patient samples, and decolonized to reduce transmission of antibiotic-resistant microorganisms in hospitals. Staphylococcus aureus is a highly successful gram-positive bacterium or superbug that has developed resistance to a wide range of antimicrobials due to selective pressures in the environment, the medical use of antimicrobials, and various genetic mechanisms for horizontal gene transfer. Penicillin-resistant strains have spread throughout healthcare facilities and communities, and methicillin (a narrow spectrum, semi-synthetic penicillin) was introduced to overcome infections caused by β-lactamase-producing S. aureus. The first MRSA strain was identified in 1961, which initially spread, worldwide, as community-acquired Staphylococcus aureus and later as hospital-acquired Staphylococcus aureus in healthcare facilities (1). Currently, MRSA is resistant to certain antibiotics, such as methicillin, cloxacillin, dicloxacillin, oxacillin, nafcillin, and closely related classes of drugs including cephalosporins (e.g., cephalexin). The primary reason MRSA has spread is because of the overuse of antibiotics and the use of drugs that are more powerful than necessary for less serious infections (2). The gene-mediating oxacillin resistance in Staphylococci is regulated by the repressor, mecI, which is divergently transcribed from mecA (the second gene in a two-gene operon that also includes mecR1). More than 90% of Staphylococcal isolates also produce β-lactamase, which is a product of blaZ (3, 4). Extended-spectrum β-lactamase (ESBL) is an enzyme that mediates resistance to extended-spectrum third generation cephalosporins and monobactams but does not affect cephamycins or carbapenems. If the infectious agent is an ESBL-producing organism in a clinical infection, this can result in treatment failure using third generation cephalosporins and monobactams. This is because the ESBL-producing strain is resistant to all penicillin, cephalosporin, and aztreonam (5). Additionally, ESBL has been recognized in a range of Enterobacteriaceae and Pseudomonadaceae from around the world (6). Thus, β-lactamases are classified into four molecular classes: A, B, C, and D, which are based on conserved and distinguishing amino acid motifs. Classes A, C, and D include enzymes that hydrolyze their substrates by forming an acyl enzyme through an active site serine, whereas class B β-lactamases are metalloenzymes that utilize at least one active-site zinc ion to facilitate β-lactam hydrolysis (7). Organisms expressing high levels of AmpC β-lactamases are a major clinical concern because they are resistant to all β-lactams except for amdinocillin, cefepime, cefpirome, and carbapenems. One encoded enzyme, DHA, was first described for Salmonella enterica serovar enteritidis in Saudi Arabia in 1997. A detailed study demonstrated that blaDHA-1 was located on an integron that originated from Morganella morganii. Additionally, plasmid-borne blaDHA genes have been found in Klebsiella pneumonia in France, Taiwan, and the United States and in Salmonella enterica serovar Montevideo in Korea (8). 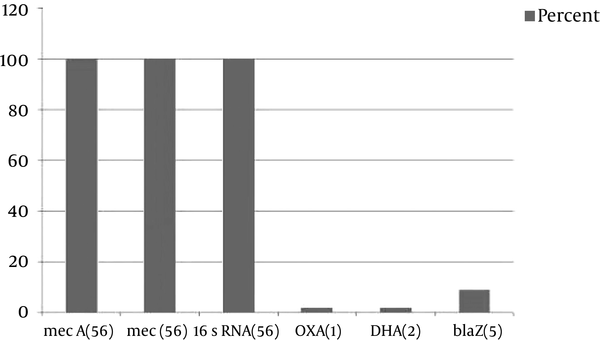 OXA β-lactamases (molecular class D and functional group 2d) are recognized as less prevalent but plasmid-mediated and diverse β-lactamases that hydrolyze oxacillin and anti-staphylococcal penicillin derivatives. The OXA-type β-lactamases cause resistance to ampicillin and cephalothin, have high hydrolytic activity against oxacillin and cloxacillin, and are poorly inactivated by clavulanic acid (5). In particular, the OXA group (class D) evolves on chromosomes and can move to plasmids (9). The majority of ESBL-producing bacteria have been detected among gram-negative bacteria isolated from hospitalized patients in all areas, including long-term care facilities and nursing homes (10, 11). ESBL-producing organisms exhibit co-resistance to many classes of antibiotics, resulting in therapeutic limitations, which causes significant challenges for the treatment of both hospitalized and community-based patients who become infected. The aim of this study was to determine the prevalence of blaOXA-1 and blaDHA-1 AmpC β-lactamase-producing MRSA in Iran. In this descriptive study, 229 swabbed nostril samples in transport media, from healthcare providers in different wards, and 827 clinical samples, from wounds, blood, cerebrospinal fluid, peritoneal fluid, tracheal fluid, and bronchoalveolar lavage, were obtained and examined at Mofid children’s hospital, in Tehran, Iran from August 2012 to July 2013. All subjects in this study did not have underlying diseases and were not taking antibiotics for two weeks prior to sampling. Specimens were taken from healthcare providers using a sterile moistened swab inserted into each nostril to approximately a 1 cm depth and rotated five times. Then, the samples were transferred quickly to the laboratory and inoculated onto a mannitol salt agar medium and incubated at 35°C overnight. The isolates were identified as S. aureus based on morphologic and biochemical tests, including DNAase (Merck, Germany), mannitol salt agar fermentation (Merck, Germany), gram staining using a gram-staining kit (77730 Sigma-Aldrich), catalase testing using 3% hydrogen peroxide, and coagulase testing using lyophilized citrate or EDTA-treated rabbit plasma (3, 12). All strains were screened for methicillin-resistance using oxacillin (1 µg) and cefoxitin (30 µg) disk diffusion tests based on standard guidelines (4, 13). The sensitivity patterns of MRSA strains were determined using the disk diffusion method (Kirby-Bauer). MASTDISCS™ AST was available and is an extensive range of antibiotics. All discs are strictly quality controlled for antimicrobial potency and batch uniformity. The antibiotics panel included cefpodoxime (10 µg), vancomycin (30 µg), linezolid (30 µg), clindamycin (2 µg), ciprofloxacin, rifampicin (5 µg), teicoplanine (30 µg), cefepime, erythromycin (15 µg), cefotaxim (30 µg), azithromycine (15 µg), ceftazidim (30 µg), minocycline (30 µg), doxycycline (30 µg), trimethoprime-sulfametoxazol (25 µg), and ceftriaxone (30 µg). Zone diameters were measured after 24 hours of incubation at 35°C. The zone inhibition diameters were based on recommendations from the clinical and laboratory standards institute (CLSI). Vancomycin screen agar plates with tripticase soy agar (TSA) supplemented with 6 μg/mL of vancomycin were used to confirm the susceptibility patterns for all MRSA strains to vancomycin. Sigma-Aldrich-861987, a vancomycin hydrochloride hydrate, was used with an American-type culture collection (ATCC), 29213 S. aureus (0.004–0.015 μg/mL), as the control strain to determine the disk diffusion quality control (3, 13, 14). The examination of MRSA strains to screen for β-lactamase production was performed using the disk diffusion method (Kirby-Bauer) and oxacillin (1 µg), cefoxitin (30 µg), penicillin (10 units), and amoxicillin/clavulanic acid (30 µg). MASTDISCS™ AST provided an extensive range of antibiotics. All discs were strictly quality controlled for antimicrobial potency and batch uniformity. Zone diameters were measured after 24 hours of incubation at 35°C. Zone inhibition diameters were based on recommendations from the CLSI (14). If a screen test was negative, it was repeated using a penicillin MIC and β-lactamase test. If penicillin MIC was ≤ 0.12 µg/mL or zone ≥ 29 mm, a PCR test for blaZ was performed (3). The Staphylococcus aureus ATCC 43300 mecA + and blaz + reference strain were used as strain controls, and the negative control was the PCR mix with water (15). DNA was extracted from all MRSA isolates using an AccuPrep Genomic DNA extraction kit (cat. no. k-3032; lot no.1008J; BIONEER). The PCR components and amplification profiles were comprised of 300 nM concentration of each oligonucleotide primer (Eurofins MWG Operon), including 5.5 mM of MgCl2; 200 mM each of the deoxynucleoside triphosphates, dATP, dCTP, dGTP, and dUTP; and 0.125 U of Taq DNA polymerase (GENET BIO, prime Taq TM DNA polymerase; lot no: 100914; cat. no. A; type: G-1002). The PCR products were analyzed using gel electrophoresis in 1.2% BIONEER agarose gels (cat. no. c-9100-1; lot. no. 1101c) in a 1X TBE buffer (890 mM of tris; 890 mM of boric acid; 40mL of 0.5 M EDTA; pH 8.0) at 100 V for 65 minutes. A green loading buffer with the DNA stain (Jena Bioscience; lot: 111.034) was used to load the samples and ladder. The sizes of the PCR products were determined by comparison with the molecular size standard (50 bp-1 Kb linear scale; low-range DNA ladder or 100 bp-3 Kb linear scale; and mid-range DNA ladder; Jena Bioscience) (3, 16-18). The clinical strain, 3MBO9 (blaOXA-1,427 bp), was used for the OXA-1 gene, and an E. coli strain, J53/pMG247, was used for the blaDHA-1 AmpC β-lactamase gene; both were used as positive controls. The negative control was the PCR mix with water (19, 20). The SPSS software 16.0 was used to analyze the data. In this study, 229 samples from healthcare providers (23 - 49 years old) from 16 different hospital wards and 827 clinical samples were examined for MRSA and collected between August 2012 and July 2013. No participants in this study had underlying diseases and none had taken antibiotics for two weeks prior to sampling. Antibiotic resistance was higher in the MRSA isolates from the clinical samples compared to the MRSA isolates from healthcare providers (P < 0.05). All isolates were sensitive to linezolid and vancomycin, and the rate of penicillin resistance was high in both groups (Table 1). Interestingly, only one blaOXA-1 and one blaDHA-1 AmpC β-lactamase was detected in one MRSA isolate from the wound of a patient with eczema. Molecular screening of genes was performed using the primers shown in Table 2 and Figure 1. Sequence data were submitted to GenBank, and accession numbers (KJ469909-KJ469910) were released on April 15, 2014, as scheduled. The worldwide emergence of MRSA is a significant challenge facing public health (21-23). Based on the center for disease control (CDC) reports, 1% of all Staphylococcal infections and 50% of healthcare-associated Staphylococci infections are caused by MRSA (24). While examining healthcare providers, this study detected 21 (12%) MRSA strains, which is similar to the results obtained by a German study in 2007 (25) and a study in western Iran in 2013 (26). These studies found a prevalence of MRSA isolates among healthcare workers and carriers at 11.3% and 17.57%, respectively. Compared to previous studies in Shiraz, Iran (5.3%) and Germany (6.5%) and by the pediatric infection research center (PIRC) of Iran (3.2%), Harbarth et al. (3.3%), Davis et al. (3.4%), Rioux et al. (6.6%), Gopal Rao et al. (6.7%), and Kock et al. (1.4%), the prevalence of MRSA found among healthcare providers in this study was high (16, 25, 27-32). Additionally, Rezaei et al. considered colonization with MRSA and methicillin-sensitive Staphylococcus aureus subtypes in patients with atopic dermatitis. They found a higher rate (33%) of MRSA colonization in the nasal cavity. The high percentage of MRSA in healthy carriers, especially those who do not exhibit any symptoms or signs of severe disease is very dangerous because such carriers can cause epidemics, raise the occurrence of severe disease among patients, and increase mortality rates by transferring strains (33). Linezolid is used to treat critical infections caused by gram-positive bacteria, such as MRSA, that are resistant to several other antibiotics. In this study, resistance to linezolid was not found in either group (34), although resistance to antibiotics among the MRSA isolates from the clinical samples was higher than among MRSA isolates from healthcare providers (P < 0.005). Nasal colonization of MRSA isolates showed variable resistance to clindamycin, ceftriaxone, cefpodoxime, azithromycine, and erythromycin, but resistance to penicillin and clindamycin were similar to those found in other studies (35, 36). Moderate resistance to conventional antibiotics, such as azithromycine, erythromycin, clindamycin, cefpodoxime, and ceftriaxone, was detected in the MRSA samples. From region to region, the degree of resistance or sensitivity of MRSA to conventional antibiotics was diverse. This is explained in (37): AmpC-producing nosocomial isolates can be responsible for outbreaks. Strains with plasmid-mediated AmpC enzymes were consistently resistant to aminopenicillins (ampicillin or amoxicillin), carboxypenicillins (carbenicillin or ticarcillin), and ureidopenicillins (piperacillin), and among the penicillins, these strains were susceptible only to amdinocillin or temocillin. The enzymes provided resistance to cephalosporins in the oxyimino group (ceftazidime, cefotaxime, ceftriaxone, ceftizoxime, and cefuroxime) and the 7-α-methoxy group (cefoxitin, cefotetan, cefmetazole, and moxalactam). MICs were usually higher for ceftazidime than for cefotaxime and for cefoxitin than for cefotetan. The enzymes were also active against the monobactam aztreonam, although for some strains aztreonam MICs were in the susceptible range. Susceptibility to cefepime or cefpirome was little affected and was unchanged for carbapenems (imipenem and meropenem). Every MRSA isolate in clinical settings must be tested for susceptibility in vitro, when antimicrobials are considered for treatment (38). In study by Westh et al. (39) in 2004, at hospitals with a prevalence of MRSA between 0% and 63%, a significant correlation was found between antibiotic resistance and the consumption of antimicrobials. Findings supported the importance of antimicrobial consumption on resistance. A positive correlation was found between S. aureus resistance to methicillin (MRSA) and consumption of β-lactam combinations, between resistance to quinolones and consumption of β-lactam combinations and carbapenems, and resistance to aminoglycosides and consumption of β-lactam combinations. The consumption of β-lactamase-sensitive antibiotics was negatively correlated to resistance to methicillin, quinolones, and aminoglycosides. Usage of the different antimicrobial therapeutical subgroups was also correlated. Consumption of β-lactamase-sensitive antibiotics (penicillin) was positively correlated to consumption of β-lactamase-resistant penicillins and negatively correlated to consumption of carbapenems, quinolones, and glycopeptides, whereas consumption of cephalosporins was positively correlated to consumption of aminoglycosides, quinolones, and glycopeptides (39, 40). In 2015, Poorabbas et al. detected MRSA in 37.5% of isolates, although no vancomycin-resistant or vancomycin-intermediate resistant S. aureus were detected (41). Similarly, Hassanzadeh et al. examined 180 HIV patients in Iran, isolating MRSA from the nasal cavities of 23 (12.8%) patients. Most of the isolates were recovered from male subjects under 40 years of age, and no variable, such as skin disease, a history of hospitalization, or infectious disease, had a significant association with the MRSA colonization rate. The presence of MRSA isolates in the nasal cavities of HIV patients at this rate indicated the potential spread of MRSA among HIV patients and emphasizes the need for establishing better prevention strategies (42). Two remarkable results from the current study were the high percentage of MRSA found among healthcare providers and the detection of blaOXA-1 and blaDHA-1 AmpC β-lactamase genes in one MRSA strain isolated from a clinical sample. One reasons for the high percentage of MRSA among healthcare workers could be ignorance of MRSA screening among this group; although healthcare providers are less affected by MRSA compared to patients, current studies have shown a significant change in the carrier rate, ranging from 0 - 29% (34, 36, 38, 41-44). Previous studies have found that the blaR1 sensor, which is a signal transducer found in Staphylococcus aureus bacteria, has a serine and carboxylated lysine motif in the active site (45-47). The protein sequence and overall folding indicated that blaR1 was evolutionarily related to class D β-lactamases. When the sensor reacts with antibiotics, it forms an acyl-enzyme complex, and Lys62 undergoes decarboxylation, switching the receptor to an “on” state and continuously inducing the expression of β-lactamase (48-53). (a) A recent stay in a long-term facility or hospital. (b) Long-term admission to neonatal intensive care units or intensive care units. (c) Wound treatment or a recent operation. (d) Having a tube, such as urinary catheter or feeding tube, inserted into the body. (e) Being a premature baby. (f) Having an immunocompromised system, especially after an organ transplant. (g) Having frequent or long-term antibiotic treatments (54). The prevalence of β-lactamase producing MRSA is problematic to public health because of the easy transfer of resistance from these bacteria to other bacteria. Therefore, this study suggested annual screening for MRSA among healthcare providers and patients to decolonize and reduce transmission of S. aureus in hospitals. We thank Dr. A. Karimi, Dr. S. Maham, and the staff of PIRC for their support. We also thank all infection control practitioners for their hard work to isolate MRSA-positive patients and healthcare workers. Authors’ Contribution: All authors were actively involved in the research process. Funding/Support: This work was supported by the PIRC at Mofid Children’s Hospital in Tehran.